I’ve upgraded my 3 year old MBP with a fast SSD. I decided to install from scratch instead of migrating or cloning the old disk. The good thing is that everything is now fast and clean. The downside is that all customisations I did over the past years are also gone. One thing I customised was shortcuts. I forgot how easy this can be done in OSX, so I’ll describe it below so others can benefit as well. Now, go back to the Terminal application and have a look at the same menu as before. It should now list the shortcut you just added. 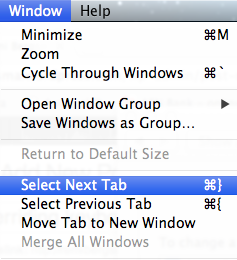 Try changing tabs by pressing CMD+left/right arrow.. it works! 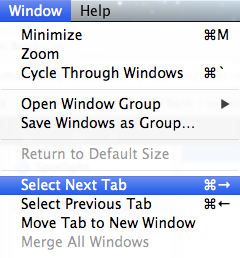 One thing to note, it that the shortcuts I used in this example, by default belong to changing windows instead of tabs. When you want to change windows in Terminal using a shortcut, you’ll need to add new shortcuts for these as well. Alternatively, you use the CMS+` shortcut which still cycles through your windows, it just cannot go back. For me this works ok as this works in any application. 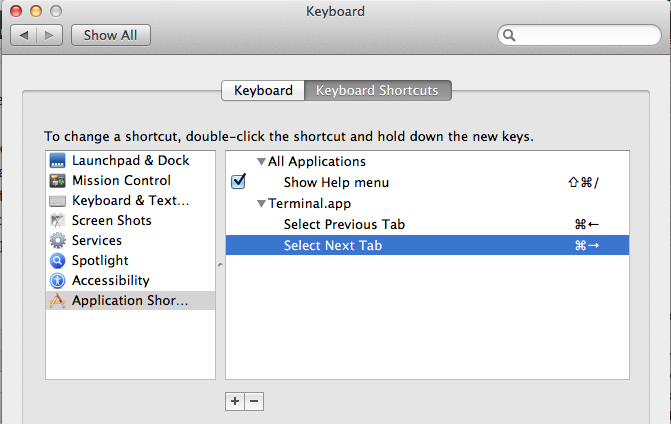 Changing shortcuts in Mac OSX is easy and allows you to make them work exactly as you prefer. I’ve done this in Mountain Lion, but I believe this can be done in Lion as well.